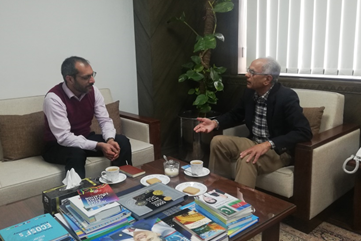 The Chief Executive Officer of Pak Alliance for Maths and Science (PAMS) Mr. Salman Naveed called upon the President ECOSF Prof. Manzoor H. Soomro at his office on March 18, 2019. Mr. Naveed briefed the President ECOSF about ongoing activities of PAMS in Pakistan for promotion of Maths and Science in the schools. Prof. Manzoor H. Soomro appreciated the contribution of PAMS in Pakistan. He shared that the strong base of Science, Technology and Innovation (STI) is the symbol of prosperity and development. China, Korea and Malaysia are the real example of STI who have become the Asian tigers. Thus, ECO region including Pakistan needs to work on STI on priority basis so that the fruits of long lasting development and prosperity can be tested by the masses of ECO region. ECOSF and PAMS have been collaborating for promotion of Science, Technology, Engineering and Maths (STEM) in Pakistan and the meeting was held to discuss and chalk out the activities for the year 2019.